B.J. Penn isn’t committing to an MMA return — but on the other hand, he’s not officially retired, either. 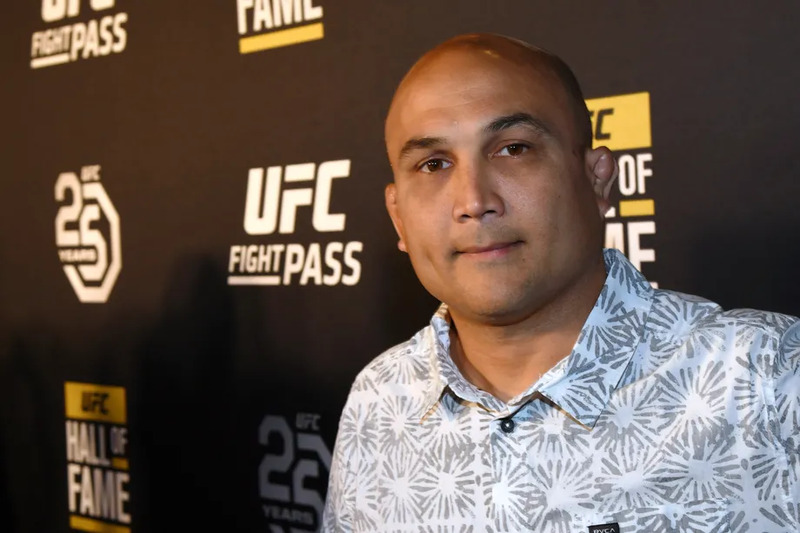 The former UFC welterweight and lightweight champion was present at the UFC Hall of Fame red carpet event last week in Las Vegas, and it’s no surprise he was asked about the chance he steps foot into the Octagon again. Penn admitted that he isn’t sure himself whether or not he plans on fighting again — right now, “The Prodigy” has no plans, he said. Penn (16-12-2) last fought at UFC Fight Night 112 in June 2017, losing to Dennis Siver by majority decision. The Hawaiian is on a five-fight skid and hasn’t won since a 2010 first-round knockout of Matt Hughes. Penn, widely considered one of the best MMA fighters of all time, last reigned over a division in 2009, when he was the UFC lightweight champion. As far as what it would take to get Penn back in the cage, it all comes down to who the UFC matchmakers find for him to face. “Give me a guy that I can beat and I’ll come back,” Penn said. Penn hasn’t trained much since his Siver loss, he said, but just recently got back into the gym. Day-to-day, Penn works at his taro farm in Hawaii and spends time with his family, which includes dropping his kids off at school and attending their soccer practices. Whether or not preparing for a fight is added to his list of daily activities is still very much up in the air. We so need a good BJ again, give him an easy one Dana. Just get him back in the cage man. That would be a train wreck. AR15 guy wrote: Give him CM Punk. Yes, it's a win win. Give him Holloway in Hawaii. It will get canceled at the last minute due to Holloway not fitting through the door of his house. Ortega will then decline the short-notice fight of course but him and BJ can then put on a 10-minute grappling exhibition event so BJ doesn't get too pooped yet can still show why he’s the prodigy. That's exactly what I came here to say. that will be a good farewell fight,if it is to happen. I agree. How many more fights does Punk have left on his contract? He had Siver dead to rights, on queer street I tell Ya! Problem is BJ only trained for a 2 round fight, that fight should have ended after Penn dropped Siver. Everyone thought the fight had ended myself included I even changed the channel. Later to everyone's surprise after the celebration was over Penn was forced to contiue the fight into round 3 kinda of like Silva was forced to fight Bisping after he KO'ed him with the flying knee, the fight was already over. A 20% Penn still hit Siver harder than a 100% Conor, just FYI. So sad they let Gomi before we got a chance for that rematch. Sign Shinya for a 3 round fight and do 1st round jits, 2nd round a DDR competition in the middle of the octagon and 3rd round strictly standup. Think that'd be the most watched fight in ufc history. [quote="DeceptaCon"]He had Siver dead to rights, on queer street I tell Ya! Problem is BJ only trained for a 2 round fight, that fight should have ended after Penn dropped Siver. After two rounds of Penn looking like a shadow of his former self. Siver forgot he was in a fistfight and got caught. I was going to say something about CM Punk but even that might be too much right now.